Food is actually good for you… so don’t starve yourself. Who would of thought that food is actually good for us. Well turns out we need calories to survive. To lose weight you simply have to be burning more calories than you consume. This advice is often misconceived and people will drastically cut calories hoping they will have their dream body overnight. Well, you didn’t get where you are now overnight so where you want to go isn’t going to happen overnight. Women have to be careful because of the fast metabolic adaptation that occurs when cutting calories. When a drastic calorie cut happens the Resting Metabolic Rate (RMR= calories burned at rest) drops over time, this prevents your body from major weight loss. Then, when the women realizes she can no longer sustain living at that caloric intake she will go back to her normal calorie intake, which is probably several hundreds of calories higher than her current intake, thus leading to weight gain. It is best to slowly decrease your caloric intake to something you can handle until you’ve reached your goal. There is no need for diet plans that make you consume only 1000 calories a day or live off protein shakes for every meal. If you’re after an awesome physique you are going to have to forget the little weights and pull up the big girl weights. Forget trying to look pretty in the gym. No one cares if you just rolled out of bed or if you just came from a fashion show.. well actually people might think you’re a little weird if you look like you were at a fashion show. The point is, you’re not there to impress anyone at the gym. Leave the impressing part to when you’re at the beach showing off the stunning body you have worked so hard for. Due to the many neurological factors of weight training for women, they cannot pack on large amounts of lean mass like men can. 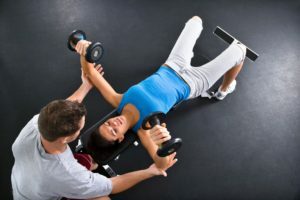 The lack of testosterone and growth hormone, and the larger amount of estrogen produced compared to males, are just a couple of the inhibiting factors women have restricting them from having the muscle mass men have. Weight training in women has many benefits. Lifting weights can have a positive impact on the regulation of hormones, this can also ease your time of the month. All in all, don’t fear the weights or getting too big. Lifting weights is one of the best ways for women to get lean and toned.